Try the website free for 30 days. The website is very simply the results of an ECONOMETRIC ANALYSIS for each week following the publication of the results and an ARBITRAGE solution to currency conversions at a profit. It will be published on a weekly basis of general and regular circulation. There is no specific portfolio and it is bonafide general disinterested commentary.Past performance is no indication of future performance. One should not invest unless he or she can afford to lose their investment. No investment required! ARE YOU READY for ECONOMETRICS? "Sure I am" you might say. An analysis of raw data by econometrics will result in an estimate of the industrials index average prices. As goes the industrials so goes the market. We will present a bull or bear probability for the estimate of the week following and an arbitrage conversion algorithm! econometrics to sway large purchases why shouldn’t you. I will show weekly what the data analysis results in. Great benefit.Not available in Ca Vt, Oklohoma. See where the estimate (black line) crosses over the actual Djia (red line). That is a buy, sell signal. Calculate the profit. 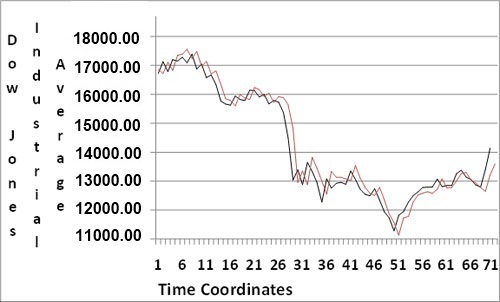 The horizontal axis is the time coordinate, the last number being last week. Sign on to see what we expect in the future predicted with neural networks or logit probit econometrics.